Treatment protocols however need to be developed for the management of fracture neck femur with unstable angina. Department of Orthopaedic, Hanumant Hospital, NNH-51, Mahuva – 364 290, Gujarat, India. Department of Orthopaedic, DeenanathMangeshkar Hospital, 9+13/2, Near Mhatre Bridge, Pune – 411004,Maharashtra, India. 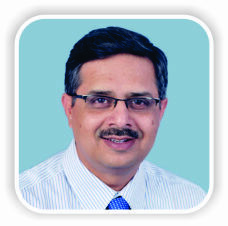 Department of Orthopaedic,Orthopaedic Consultant, DeenanathMangeshkar Hospital, 9+13/2, Near Mhatre Bridge, Erandwane, Pune – 411004, Maharashtra, India. Introduction: Fracture neck of femur is a leading cause of hospital admission in elderly population. Studies have shown up to 25% mortality following hip fracture within 1year of surgery . We report a case of fracture neck of femur in a high-risk patient with end-stage renal disease who was operated with bipolar hemiarthroplasty. We noticed favorable outcome following coronary artery bypass graft (CABG) and orthopedic surgery. Case Report: We report a case of 72-year-old male presenting with the right hip pain for 2 days and inability to bear weight on the right lower limb following history of domestic fall 2 days back. Radiograph of pelvis with both hips anteroposterior view and lateral view of the right hip showed right fracture neck of femur. The patient was scheduled for surgery next day but was deemed unfit on the ground of electrocardiogram reports showing ventricular arrhythmia. Cardiologist opinion was sought and coronary angiography was done. Coronary angiography revealed triple vessel lumen blockade. The patient underwent CABG 2 weeks after admission. We did cement bipolar hemiarthroplasty for the right fracture neck of femur 1 week later. The patient was mobilized on day 2 using walker. Follow-up radiograph showed acceptable prosthesis position. Conclusion: Fracture neck of femur with associated cardiac risk and end-stage renal disease require meticulous planning before surgical intervention. Our case highlights the need of stabilizing medical and cardiac parameters before orthopedic intervention. One of the absolute contraindications for surgery in fracture neck of femur is unstable angina. Stabilization of unstable angina is necessary and demands priority over surgery for fracture neck of femur. Although there is time delay due to unstable angina and other medical conditions with fracture neck of femur, there is a need for further evaluation in such patients to get favorable outcome. Keywords: Cardiac arrhythmia, Hemiarthroplasty femur, Hip. Fracture neck of femur is a leading cause of hospital admission in elderly population. Studies have shown up to 25% mortality following hip fracture within 1 year of surgery . There are reports which have advocated operative intervention within 48 h to reduce morbidity and mortality . We report a case of fracture neck of femur due to domestic fall in a cardiac high-risk patient with end-stage renal disease who was deemed unfit for orthopedic surgery. The patient underwent coronary artery bypass graft (CABG), followed by cemented bipolar hemiarthroplasty a week later. We noticed favorable outcome following CABG and cemented bipolar hemiarthroplasty. A 72-year-old male patient presented to our emergency department with the history of domestic fall, right hip pain, and inability to bear weight on the right lower limb. The patient was a known case of ischemic heart disease with unstable angina, Type 2 diabetes mellitus, hypothyroidism, and end-stage renal disease. Initial clinical evaluation revealed tenderness at the right hip, unable to do active straight leg raise test on the right side, and restricted range of movements of the right hip in all planes. There was no external wound, sinus or discharge from any skin sites. Plain radiograph of pelvis with both hips and the right hip lateral view showed fracture neck of femur, AO type 31 B3, in the transcervical region (Fig.1). Laboratory tests showed hemoglobin -14.9g/dl, total leukocyte count – 15460/cumm, neutrophils – 65%, lymphocytes – 30%, blood urea – 73, serum creatinine – 2.3, and fasting blood glucose level – 220mg/dl. According to K-DOQI criterion, our patient had glomerular filtration rate<30ml/min/1.73m2, our patient was identified as having end-stage renal disease .However,for unstable angina, there are no laid down guidelines. The patient was scheduled for cemented bipolar hemiarthroplasty next day. However, the patient suffered chest pain and investigations revealed myocardial infarction. Hence, surgery was postponed. Angiography revealed lumen blockade in major vessels. The left anterior descending showed 85% stenosis, middle and distal right coronary artery 95% stenosis. In view of triple vessel disease, early CABG was planned. Due to pre-operative deranged renal function parameters and urinary tract infection, CABG was further postponed. Following normalization of renal parameters and treatment of urinary tract infection, the patient underwent CABG, 3 weeks after trauma. Postoperatively, the patient was shifted to cardiac care unit for monitoring. 1 week following CABG, the patient underwent cemented bipolar hemiarthroplasty for fracture neck of femur (Fig.2). Surgery was performed under general anesthesia. Preoperatively, blood was arranged to replenish excessive blood loss and bipolar electrocautery was used intraoperatively to achieve hemostasis. As the bone was grossly osteoporotic, cemented hemiarthroplasty was done. The procedure was uneventful. The patient was mobilized on day 2 with walker assistance. Sutures were removed on day 14 and ambulation with stick was started after 3 months. 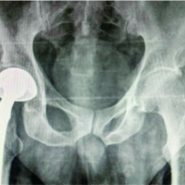 Initial follow-up at 2 weeks, 3 months, and 6 months post-operative and plain radiography of the right hip in anteroposterior and lateral view showed well-fixed prosthesis in acceptable central position without any evidence of loosening or subsidence. We advised our patient not to squat or sit crossed leg to prevent implant dislocation. The patient was community ambulator following surgery. He died due to cardiorespiratory arrest, 2 years after surgery. There is limited literature about the guidelines in the management of patients of fracture neck of femur with unstable angina. However, we noticed increased hip fracture in patient with heart disease. Osteoporosis and heart failure are a common coexisting risk factor in elderly population . Carbone et al., in 2010, found that mortality in patients with heart failure with concomitant hip fracture is 2times more compared to those with heart failure alone, irrespective of gender . Our patient suffered hip fracture and was a known case of heart failure with ventricular tachycardia. Many studies in the past have suggested that hip fracture should be operated early, preferably within 2 days of trauma to reduce the morbidity and mortality . Currently, there are no established guidelines for the management of CABG with hip fracture. Furthermore, the time lapse and ideal time to perform surgery post-CABG are not mentioned. NICE guidelines (2011) have emphasized on operating hip fracture on the day or day after admission, after correcting treatable comorbidities to avoid delaying surgery . However, AHA guidelines have mentioned the need of revascularization before treating hip fracture . In view of age, fracture pattern, and urgency of surgery, we planned the bipolar hemiarthroplasty. However, the sudden occurrence of chest pain demanded further medical and cardiac evaluation. Angiography revealed 85% stenosis in the left main coronary artery, and hence, procedure was delayed. As per the American Heart Association 2014 clinical practice guidelines, in such Class I patients, where benefit outweighs the risk, coronary revascularization should be done before proceeding with any non-cardiac surgery, to reduce perioperative cardiac events . Moreover, 2011 American Heart Association guidelines recommend performing CABG in patients with sustained ventricular tachycardia with the left main coronary artery stenosis more than 50% . Another study by Eagle et al. have reported favorable outcome in heart failure patients who underwent CABG before non-cardiac surgery . Though, they have not opined about how early CABG should be done prior to non cardiac surgery. As the bone was grossly osteoporotic and we wanted to mobilize patient early, we favored cemented procedure over uncemented hemiarthroplasty. Kaluza et al., in 2000, have raised concern and suggested delaying any non-cardiac procedure for atleast 2–4 weeks following cardiac procedure to reduce the risk of thrombosis and bleeding complications . We operated our patient within 1week of CABG and did not observe any bleeding complication. There is a need for reassessment of guidelines for unstable angina with hip fracture where we should not delay surgery in view of relative contraindications. We advocate further studies on how long one should wait before taking for emergency surgeries. We encountered a very high-risk elderly patient with hip fracture. The concomitant existence of two major medical and surgical conditions posed a challenge for the health-care team. Performing the CABG preoperatively and then cemented bipolar hemiarthroplasty for hip fracture reduced both perioperative and post-operative risk. When to take up the patient for cardiac surgery, AAOS guidelines have stated that hip surgery should not be delayed if the patient is on thromboprophylaxis. Therapeutic dose of subcutaneous low-molecular-weight heparin is 1mg/kg 12hourly and prophylactic dose is 1mg/kg 24hourly. We mobilized our patient with walker support 2 days following surgery and during follow-up at the end of 2 years, our patient was community ambulating. Stabilizing the cardiac parameters reduced the perioperative risk for the second surgery of bipolar hemiarthroplasty and helped in early mobilization following surgery. Fracture neck of femur is a leading cause of mortality and morbidity in elderly patients. Patients with associated cardiac risk and end-stage renal disease require meticulous planning before surgical intervention. Our patient had fracture neck of femur with coronary artery blockage that mitigates the importance of treatment of both fracture and coronary artery blockage. We did CABG followed by cemented bipolar hemiarthroplasty, both being major surgical intervention. Our patient responded well to both the procedures and was discharged without any inadvertent event. This case highlights the importance of management of cardiac stabilization and urgency of fracture fixation for early mobility. Fracture neck of femur is a common orthopedic injury in elderly age group and preexisting medical comorbidities increase the operative risk. We emphasise the need for universal guidelines in management of patients with fracture neck of femur with unstable angina and factors which can be considered as absolute contraindications. 1. Leibson CL, Tosteson AN, Gabriel SE, Ransom JE, Melton LJ. Mortality, disability, and nursing home use for persons with and without hip fracture: A population‐based study. J Am Geriatr Soc 2002;50:1644-50. 2. Moja L, Piatti A, Pecoraro V, Ricci C, Virgili G, Salanti G, et al. Timing matters in hip fracture surgery: Patients operated within 48 hours have better outcomes. A meta-analysis and meta-regression of over 190,000 patients. PLoS One 2012;7:e46175. 3. Palevsky PM, Liu KD, Brophy PD, Chawla LS, Parikh CR, Thakar CV, et al. KDOQI US commentary on the 2012 KDIGO clinical practice guideline for acute kidney injury. Am J Kidney Dis 2013;61:649-72. 4. Chen SJ, Lin CS, Lin CL, Kao CH. Osteoporosis is associated with high risk for coronary heart disease: A population-based cohort study. Medicine (Baltimore) 2015;94:e1146. 5. Carbone L, Buzková P, Fink HA, Lee JS, Chen Z, Ahmed A, et al. Hip fractures and heart failure: Findings from the Cardiovascular Health Study. Eur Heart J 2010;31:77-84. 6. Ftouh S, Morga A, Swift C; Guideline Development Group. Management of hip fracture in adults: Summary of NICE guidance. BMJ 2011;342:d3304. 7. Fleisher LA, Fleischmann KE, Auerbach AD, Barnason SA, Beckman JA, Bozkurt B, et al. ACC/AHA Guideline on Perioperative Cardiovascular Evaluation and Management of Patients Undergoing Noncardiac Surgery. Circulation; 2014. 8. Hillis LD, Smith PK, Anderson JL, Bittl JA, Bridges CR, Byrne JG, et al. ACCF/AHA Guideline for Coronary Artery Bypass Graft Surgery. Circulation; 2011. 9. Eagle KA, Brundage BH, Chaitman BR, Ewy GA, Fleisher LA, Hertzer NR, et al. Guidelines for perioperative cardiovascular evaluation for noncardiac surgery: An abridged version of the report of the American College of Cardiology/American Heart Association Task Force on Practice Guidelines. Mayo Clin Proc 1997;72:524-31. 10. Kaluza GL, Joseph J, Lee JR, Raizner ME, Raizner AE. Catastrophic outcomes of noncardiac surgery soon after coronary stenting. J Am Coll Cardiol2000;35:1288-94. 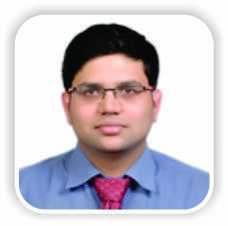 How to Cite This Article: Umesh B, Deshmukh R. Bipolar hemiarthroplasty of hip in an unstable angina patient: A case report. Journal of Orthopaedic Case Reports 2018 Nov-Dec; 8(6): 42-45.